The next audiobook of psychological suspense and obsession from the author of the blockbuster best seller legal thriller Exit Strategy. When Kat's warnings fall on deaf ears, she uncovers a horrifying truth that will place those closest to her in mortal danger. Now it's a race against the clock for Kat to expose a killer before he strikes again. Blowout is the third book in the Katerina Carter Legal Thriller series and a riveting psychological legal thriller you'll want to listen to with the lights on! Another fantastic book by Colleen Cross, the third in the series with Kat Carter, fraud investigator. In this book Kat, Jace and her Uncle Harry are with a friend on a yacht , but there is something mysterious about their host. Plenty of adventures are to be had by Kat in this installment. This is a personal case as the person involved is Kat’s best friend, I did find her friend to be a little stupid though. The book is well written, very well narrated, suspenseful. A worthy read or listen. I was given an audiobook from the author in exchange for a review. This is the second book I have “read” in this series! It’s simply fun. The characters are next door neighbor type people making it easy to get into the story! It’s an easy listen and easy to track with enough plot twist to keep one engaged! I love that this book is “clean” enough for teen readers too! The narrator has become one of my favorites with a clear crisp voice and easy to distinguish character changes! This is the third book in this series and it just gets better. This time Kat and the gang are on yacht with a killer. But it seems only Kat can see something wrong. This book kept me on the edge of my seat. I am yelling at Kat don't go in that cave. But does Kat listen? No. I was also yelling at the others that they should listen to Kat's instinct about their host. This is a great series and it will keep you entertained and you may get frustrated with Kat when she decides to do crazy things or when the others do not see what Kat sees and do not listen to her. I can't wait till the next book. The narrator does as great job bringing each character to life. The author has created fantastic characters. I was gifted this book at my request for an honest review. Blowout by Colleen Cross brings back my three favorite characters in Katerina, Jace and Uncle Harry. The author has written a highly addictive series in the Katerina Carter fraud thrillers. I find most of the characters to be endearing. I love the twists and how the author does not write the same cliche' storyline. With each book, I learn something new, which is awesome. I thought that Petrea Burchard really brought the characters to life with her performance. She gave them distinguishable voices. I requested this review copy audiobook and have voluntarily written this review. I will most definitely listen to more books by this author and narrator. This book is a standalone listen and part of a series, and my favorite to date by the author. Kat, Jace and Uncle Harry are set to take a small working vacation for Jace's job. He is doing an extended story on a Historical Cult. Only thing do not start out as planned. First he's late then the flight get canceled so the only option left is by boat. Kat's longtime friend stops by with her new boyfriend and he offers to take them. Everyone but Kat is drawn in to him. And she's accused of biased. Only shes not. This case is more personal for everyone. And it turns out they are all in danger. I love the historical back story and the hint of treasure. It made the story so fun and adventurous. I think this may be my favorite Katerina Carter book to date! Petrea Burchard did a fantastic job on the narration. Petrea really ramps up the suspense! ***** Kat is usually very smart and a bulldog at rooting out fraudsters, but she's hampered this time because her best friend and also her own rat of a boyfriend have been taken in by a world class swindler/murderer. Lots of suspense and tough situations made worse by the idiocy of the boyfriend but mitigated by her uncle. There are also a lot of interesting historical facts hiding among the fiction. A very tense but excellent read! Petrea Burchard really ups the ante with her compelling narration! I requested and was very lucky to receive a free audiobook. Yay me! This is an audible book I requested and the review is voluntary. This book is very suspenseful because all through the book the reader knows the "billionaire" is a scam artist and cold blooded murderer and she can't convince her friends as they are trapped in a yacht. Great characters and plot!! I would get rid of that boyfriend! Narration was excellent! She made the story even more suspenseful! 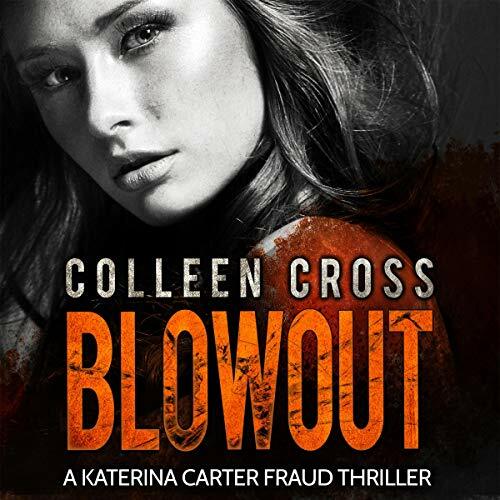 Blowout is the third in this exciting mystery series starring Katerina Carter, a forensic accountant and fraud investigator. Rather than tackling a professional case, in this third outing, Katerina must solve a mystery that hits much closer to home. Kat and her boyfriend Jase are planning a romantic/working getaway to an island in the Puget Sound when her childhood friend Gia stops by to introduce her new boyfriend. Rafael is a seemingly wealthy and charming billionaire. Trained by her profession to be suspicious, Kat takes an immediate dislike to Rafael and questions his motives, especially when he offers the use of his yacht to take Kat and Jase to their island. Suddenly, Kat's romantic weekend includes Gia, Rafael, and her Uncle Harry. Although I figured out pretty early in the story Rafael's true identity, it was fun watching Kat put the clues together to arrive at the same conclusion. She is hampered in her efforts by the entire group, all of whom are captivated by Rafael to the point of giving him thousands of dollars to invest in his company. Adding to the intrigue is the history behind the island they are visiting for Jase, a reporter, to research a story about both a former cult from the 1920's and a possible buried treasure. I really enjoyed the interplay between Jase, Uncle Harry and Kat, and my only complaint was that Gia refused to see sense until the very end, but even that conflict added to the tension level and kept me listening. Petrea Burchard's narration is wonderful. She narrates all three books in the series, so she is truly the voice of Katerina Carter. She differentiates extremely well between the characters, and I especially enjoy her portrayal of Uncle Harry. I would definitely listen to more audiobooks that she narrates and/or that Cross writes. I received a copy of this audiobook in exchange for my honest review.